Dr. Angel Pichardo Almonte is a professor, medical doctor and social movement leader from Santo Domingo, Dominican Republic. A practicing physician, Dr. Pichardo is the director of the health clinic Asesoria Nutricional para el Desarrollo Armonico (ANDA). He brings a holistic approach to health care, integrating nutrition, reiki, medicinal plants and Chinese medicine into his repertoire for healing. His clinic facilitates the formation of support groups and education circles for patients with similar health problems, which address social, cultural and economic factors that contribute to general health or illness in communities. He is an accomplished researcher and practitioner on eliminating violence against women and has developed community practice methodologies according to the tenets of participatory action research (PAR). 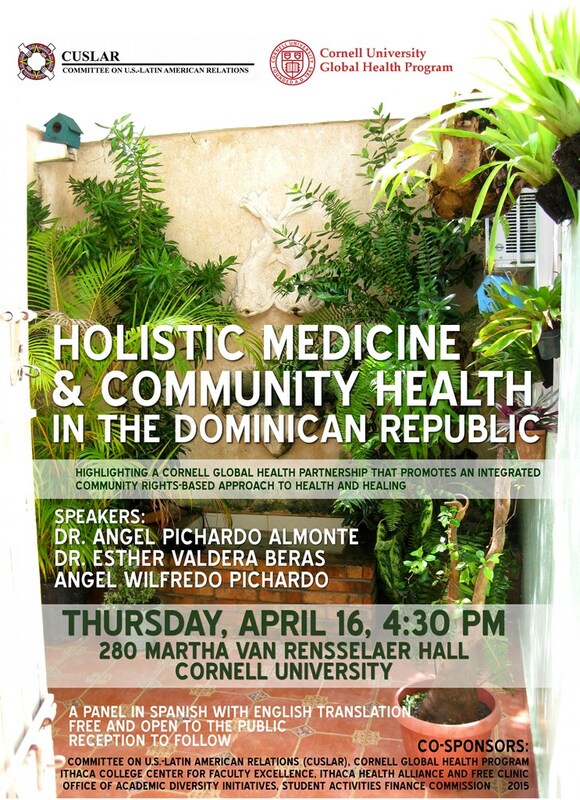 Dr. Pichardo is the lead Dominican partner in the summer service-learning program that hosts Cornell undergraduates in the Dominican Republic via collaboration with the Cornell Global Health Program and CUSLAR. Dr. Esther Valdera Beras is a primary care physician at a public Dispensario Medico in Santo Domingo Norte, Dominican Republic. A graduate of Cuba’s rigorous Escuela Latinoamericana de Medicina (ELAM), Dr. Valdera has returned to the Santo Domingo neighborhood where her family still lives to practice in the public sector. Her specialties include treatment of tuberculosis and monitoring high-risk pregnancies. She is a partner in the Cornell Global Health / CUSLAR global service-learning program each summer. Read more about the 2014 program in the Winter 2014-15 CUSLAR Newsletter. Sponsors: CUSLAR, Cornell Global Health Program, Office of Academic Diversity Initiatives, Ithaca College Center for Faculty Excellence, Ithaca Health Alliance and Free Clinic, Student Activities Finance Commission.